Among the wonderful items that have recently been brought to light at the Sarjeant Gallery Te Whare o Rehua Whanganui as a result of the relocation of the collection to Tāupo Quay is a bound volume labelled ‘Galleries’. From the outside this item appears quite unassuming. It is only upon opening the cover that one discovers its secret: a series of beautiful albumen photographs of paintings, architectural views, and sculptures taken in Italy in the late nineteenth and early twentieth century that have been pasted to its pages. The ‘Grand Tour’ on which the album takes us commences in Rome, showcasing the spectacular interior spaces of the Vatican Museums complex. Having made our way through the galleries we are then invited to look more closely at individual sculptures from the collection, each isolated from their setting by means of a black background. As you turn the pages, works from other Italian collections also begin to be represented, including sculptures from the Musei Capitolini and Museo Archeologico Nazionale di Napoli, and paintings from the Academia Nazionale di San Luca, Galleria Borghese, Palazzo Pitti, and the Galleria degli Uffizi. The tradition of arranging photographic reproductions of artworks into personal albums was established as early as the 1860s. These albums could be purchased or compiled by Victorian travellers using stock photographs to provide a record of what they had seen. Such volumes also found a market among educational institutions, museums and art galleries, where they were used alongside reproductive engravings and etchings, and later lithographs, to provide wider social access to art collections from around the globe. Among the photographers who specialised in this genre of photography was the Brogi studio. Established by Giacomo Brogi in Florence in 1860, the firm published its first catalogue advertising photographs of famous artworks in 1863 and later developed a chain of shops in Rome and Naples. Following his death in 1881, his two sons, Carlo and Alfredo, took over the firm and under their leadership the focus of the business shifted to reproductions of paintings, mosaics and drawings. 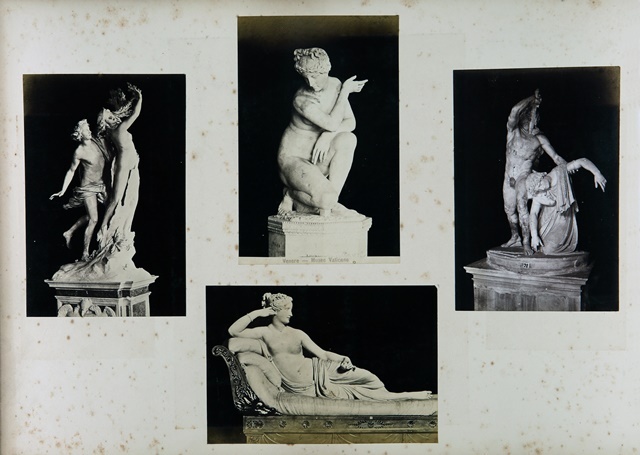 A selection of their photographs of paintings held in the Palazzo Pitti and Galleria degli Uffizi collections appear within the pages of the ‘Galleries’ album. Grouped in a bound volume, the photographs in the ‘Galleries’ album have a rich story to tell. In particular, the album tells us about the aesthetic tastes of its unidentified compiler and the society in which it was made. In this case the artworks selected were European sculptures and paintings, predominantly dating to antiquity and the Renaissance and Baroque periods. The sequence in which the photographs are presented and the juxtaposition of images on the pages is also of interest. Bringing together works from different physical locations, albums such as these encourage comparison between artworks, inviting new readings and interpretations. Several pages near the centre of the album, for example, present a selection of Madonna and Child paintings, where one can compare the different treatment of this theme by Raphael Sanzio and Bartolomé Esteban Murillo. Perhaps what intrigues me most about this album is its relationship to the present. Today photographs of artworks continue to be used by art galleries and museums around the world to make their collections accessible to the public. Appearing in books, on merchandise, and online databases, the art of reproductive photography is very much alive and well. The Sarjeant Gallery is no exception, with the photographs created by our own photographer, Richard Wotton, providing a useful tool not only for the identification of artworks on the gallery’s database, but to enable us to share works with the public when they are not on display. Laure Boyer, ‘Giacomo Brogi (1822-1881), Carlo (1850-1925) and Alfredo (d.1925)’, in Encyclopedia of Nineteenth-Century Photography, edited by John Hannavy, USA: Routledge, 2008, pp 217-218.